I thought I'd start off with this wonderful TED video about body language and how it applies to belly dancers. "Fake it 'till you become it"
We often hear "fake it 'till you make it", but did you know that after a while, what emotion you are "faking" actually becomes a part of you? How you carry yourself affects your testosterone (dominance hormone) and cortisol (stress hormone) levels in the brain, so powerful people tend to have higher levels of testosterone but low levels of cortisol. Cuddy's study found that after just 2 minutes of doing a "power pose", high power people had a 20% increase in testosterone and a 25% decrease in cortisol, whereas low power people had a 10% decrease in testosterone and a 15% increase in cortisol. This is the key to changing your confidence and body language. Doing a power pose (e.g., standing in a wide stance with your arms on your hips, sitting up straight, etc.) for only 2 minutes is what changes your body language to appear more powerful and confident, which in turn changes how you think about yourself and the situation. When you try to make yourself appear smaller, it has the opposite effect. Take note of what you normally do right before you perform. Do you chat nervously with other dancers backstage? Do you stress yourself out with negative thoughts about how unprepared you feel? Do you frantically listen to your song over and over again? All of these are counter-productive to your confidence! Next time you are backstage, take 2 minutes by yourself to calm your nerves and mind. Stop your negative thoughts and stand tall and proud. Doing this simple but effective exercise before every time you perform will eventually become a habit you no longer have to think about. Every one, even top professionals, feels nervous before they perform. But once you change your body language, it can change your thought patterns and those nerves can turn into excitement. Think "I'm excited" as opposed to "I'm scared". Once you come back off stage, don't ruin all your hard work by bad-mouthing yourself! If someone compliments you, simply thank them politely. Don't quickly start defending yourself or your performance as if you had done something wrong. Don't engage in negative talk about yourself. All the adrenaline you feel during your performance is still lingering after, so now is not the time to over-analyze how you danced. Wait until the video comes out and then look at what you would want to improve. Enjoy & savor the moment you spent on stage! 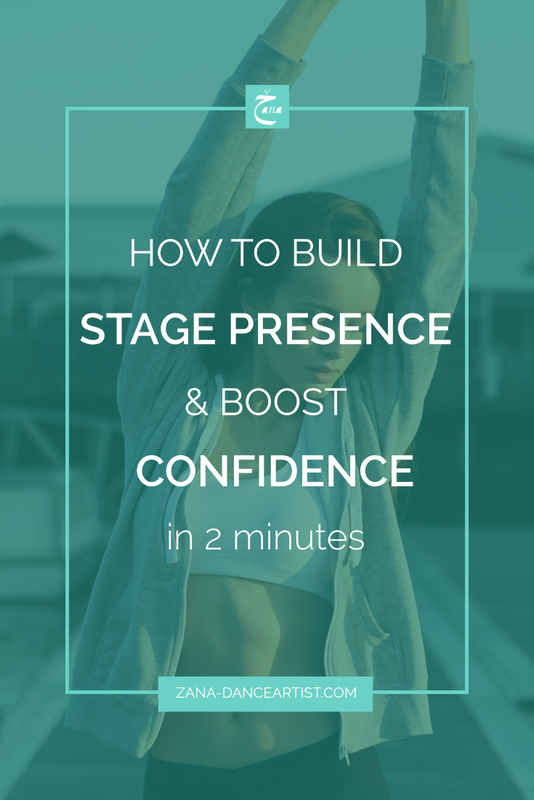 What tips do you have for building stage presence & boosting confidence?